In 2012 the Pascal chair of the Faculty of Science of Leiden University, and particular of Leiden Institute of Advanced Computer Science (LIACS), will be held by Prof. Dr. Kyle Gallivan, Department of Mathematics, Florida State University, USA. Prof. Gallivan has a long international standing as a key researcher in parallel and distributed computing. 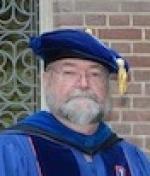 His research activities span multiple areas in this field of computing ranging from application research, e.g., Circuit Analysis, Large Scale Control and Systems, and Signal Processing, through the design and analysis of fundamental mathematical algorithms, e.g., optimization on Riemannian manifolds, to research on compilers and architectures, e.g., Hierarchical Memory Management and Data Dependence Analysis. Prof. Gallivan will stay in Leiden during the months of June and July. On July 12 at 16:00 hrs, he will give the Pascal lecture: "An Introduction to Methods for Optimization Problems on Reimannian Manifolds".